Hyper-V and sleep–what more could you ask for? Although I’ve installed it a couple of days ago, I am still smiling. Why? Because after several long years of waiting, I’ve finally installed a versi0n of Windows that supports Hyper-v virtualization and sleep at the same time – the new Windows 8 consumer preview. For years I‘ve been using Windows Servers on my laptop in order to get Hyper-V, but lack of support for sleep and the necessity to cleanly shutdown and boot up the operating system over and over again was killing me. So the promise that we will get it all in Windows 8 was appealing. I have installed Windows 8 as a dual boot configuration using boot from vhd. Quick hints on how to do that: prepare a vhd file of appropriate size (30GB in my case), boot from windows installation dvd, Shift-F10 to jump in the command prompt, attach the vhd file, in the “where do you want to install Windows” dialog point to the vhd file and go on with the setup. See here for info on creating a vhd file and attaching it from the command line. Windows will take care of installing the new loader and configuring dual boot. For info on how to enable Hyper-V in Windows 8 CP go here. Hyper-V works like a charm. One nice surprise: it supports connecting virtual networks directly to wireless network card. No workarounds required. It just works. Unfortunately, the Sleep option was nowhere to find. This page hinted that the video driver may be the reason why the Sleep option doesn’t appear in the Shutdown menu. I have HP Elitebook 8740w with NVIDIA Quadro FX 2800 graphic card. Luckily NVIDIA had the updated driver. Once the proper driver was installed the Sleep option appeared. End of a happy story. My laptop is going to sleep now. Good night. Tomorrow is preconf day of another NT Konferenca in beautiful town of Portoroz, Slovenia. In our whole day track, Steve Forte will start the day with sessions on TFS and agile processes with Microsoft tools and I will follow with two sessions on automated tests tools and practices and cover everything from unit tests to the Lab management. New to Agile? Having challenges implementing an agile process in your organization? Have you been using Scrum, but need to bend the rules to make it work in your organization? Can’t get the business to “buy-in”? Come and learn about implementing an agile process in your organization. You'll look at the “buffet table” of agile processes and procedures and learn how to properly decide “what to eat.” We’ll start by defining XP, Scrum, Kanban and some other popular methodologies and then learn how to mix and match each process for various scenarios, including the enterprise, ISVs, consulting, and remote teams. Then take a look at agile tools and how they will aid in implementing your development process. Learn how Microsoft’s application lifecycle management (ALM) tools can support your development process. Lastly, we will talk about how to “sell” agile to your business partners and customers. The speakers have a very interactive style so participation is encouraged and there will be plenty of time for Q&A. Are you able to consistently deliver high quality software with each new release? Are you able to deliver rapidly (every month or even more often) or at least to deliver with ease whenever your end users would like you to? Can you measure the quality of your code? Can you say when your software is ready for delivery? How often do you find bugs that were already solved previously? Visual Studio and Team Foundation Server 2010 offer tools and support automated processes that can help you answer above questions. They can shield you from regressions, help you measure, control and protect the quality of your code. In this session we will start with simple things like unit tests and code coverage. Using Pex, one of the Visual Studio Power tools, you can generate unit tests and achieve higher levels of code coverage easier. Next step are the functional tests – Coded UI tests that also can be generated. All of these tests should be automated and executed with every new build. Very often even the manual tests can be recorded and used as basis for generation of Coded UI tests. Test impact analysis, manual tests, tools for manual testing and more will also be discussed. Introduce Lab Management and combine all these tools, and automatically execute Build – Deploy – Test workflows, where each new version of your software is deployed and all tests executed in all supported test environments. Come and see all tools in live action, discuss automated quality oriented development processes and learn how to use Visual Studio and Team Foundation Server 2010 to get your code clean of bugs and then stay clean in each subsequent release. TeamCompanion 4.0 is Done Done! Today Ekobit announces general availability of TeamCompanion v4.0. In its fourth major version (and eight public release altogether) TeamCompanion comes with lot of features. If you only have a couple of minutes then just watch the quick overview video. Following is the list of major new features. d) Execute work item query every time it is displayed. Let’s see what each of the entries from the above list is about. Complete support for agile project management covers needs of an agile team. For Scrum teams in particular, it offers great support for all major roles and major phases in a sprint, and helps during each of the meetings (Sprint planning, Daily Standup, Sprint review and Retrospective). “Plan and Prioritize” node in the tree leads to custom specialized UI that provides support for backlog grooming and prioritization, sprint planning and balancing load within team and for day to day task tracking using burndown chart. Once again here is the quick overview video for the agile PM features. 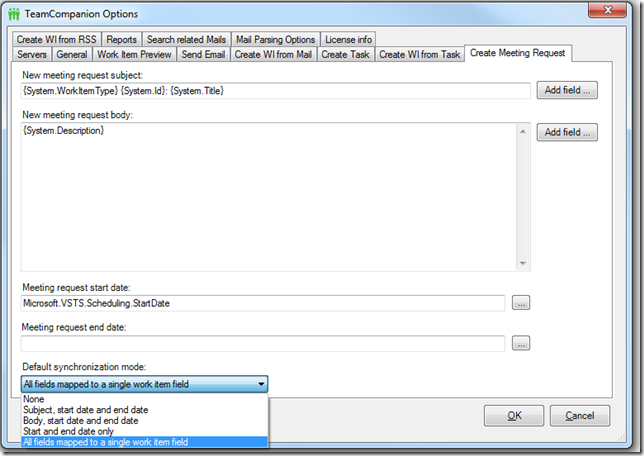 It is easy to change priority of each backlog item (PBI) simply by using drag and drop. Various filtering options available through buttons above the grid help manipulate PBIs. You can filter by iterations (makes sense even if you are working in the product Backlog since (union of the) contents of multiple iterations may be considered the Backlog), by assignment (team members), area path, work item type and state. Full-text search as filter option is also provided. Btw. 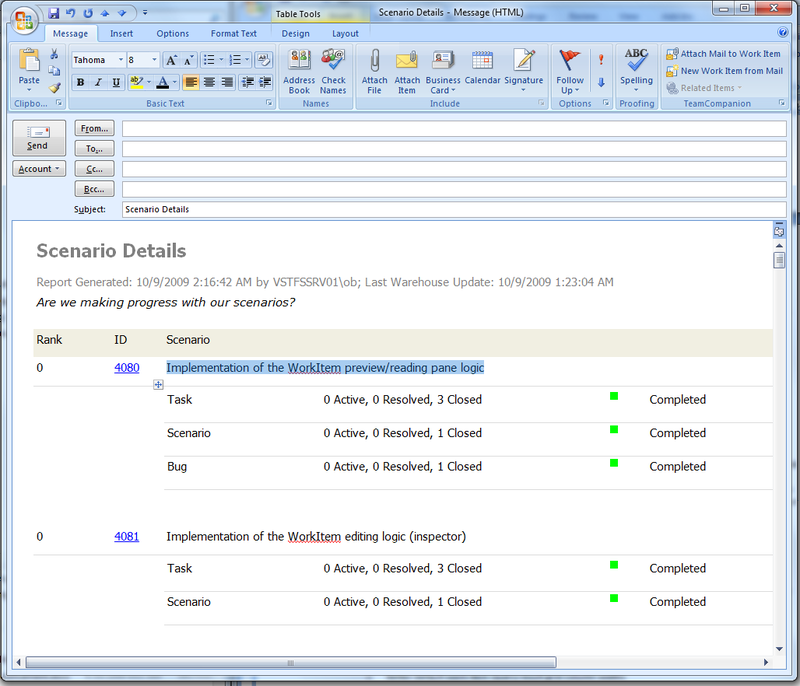 note that all grids in PM tools and otherwise, are TeamCompanion’s enhanced grids offering many different actions for the work items displayed as visible in the following screenshot. Wherever you see a grid with work items inside, count on right mouse click and all different actions. By dragging and dropping PBIs to an iteration node (on the right) they are assigned to particular iteration. Statistics above the backlog grid are adjusted accordingly. Once you are happy with your product backlog turn to the sprint backlog. …and continue with assigning tasks to team members until you reach feasible plan. Simply drag PBIs together with their tasks or particular tasks and drop them on team members. Charts will adjust accordingly. Entries in the right bottom corner can be used to assign PBIs and their tasks to people, activities, areas or different iteration including returning them to the Backlog. All of that using drag and drop naturally. As you can see changed work items are shown in italics and Undo and Save buttons are active. All changes are firstly done locally and only if you are happy you can save them. Otherwise, undo and try something else. This kind of what-if analysis is especially useful for planning where you might like to work out different options before you settle for the optimal one. Once you start sprinting, TeamCompanion lets you constantly know what is going on by providing real time burndown chart (based on transactional work item data, not the OLAP cube). It is best practice to use work item query scheduling feature to configure fetching relevant work item data on regular basis (e.g. ever 15 minutes, or every hour or day, depending on how closely you want to follow events). Now, just lay back in front of the Burndown pane and watch events unfold. 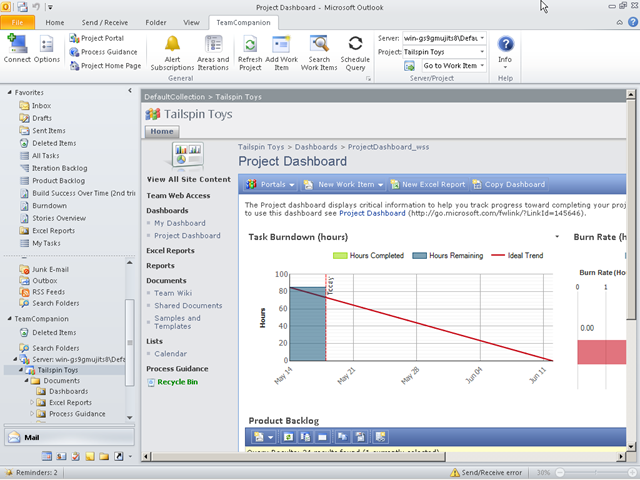 Agile project management features work with any TFS process template, but three templates are supported out of the box. They are MSF Agile 5.0. MSF CMMI 5.0 and MS VS Scrum 1.0. These three templates will be automatically recognized and if your team project is based on one of them, you can start using the tools straight away. For other templates you will firstly have to configure the tool. Don’t worry, configuring it is easy. Just press Configure button in the ribbon. In the first tab of the process template configuration dialog, various settings are defined that make it possible for TeamCompanion to show the Backlog, support changing the order of PBIs using drag and drop, provide statistics etc. 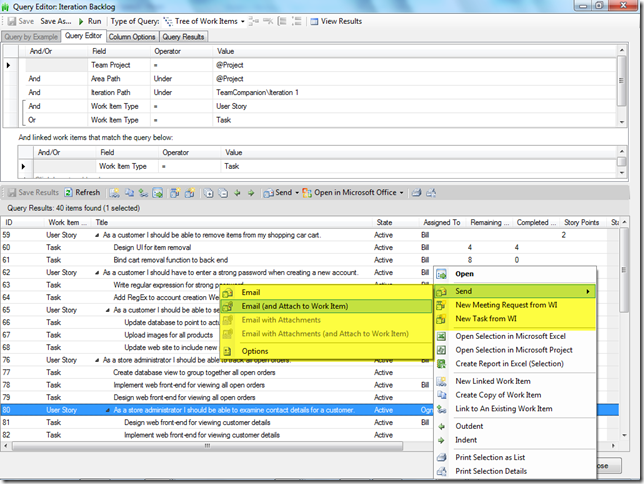 In the second tab Sprint work item is chosen (currently used in MS VS Scrum 1.0 template only). In the third tab, Active and Done states for the PBI work item type are defined. Remember that the PBI work item type itself is defined in the first tab. 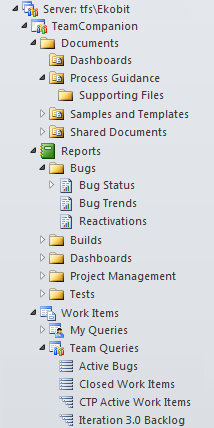 In the fourth tab you can define the columns for the backlog grids. By default only project collection and project administrators can edit these settings. Since this is obviously too restrictive, in the fifth tab they can give permission to edit the process template configuration to any TFS security group defined for the project. These were the process template configuration settings. In following screens you can see how to define your team, iterations (sprints) you will work on and areas that should appear in the planning UI. Embedded work item form gives you ability to edit the work item selected in the grid. Also, it provides access to additional work item fields and properties that aren’t displayed in the default view. And finally, it offers the UI you might be used to in Team Explorer. In previous version TeamCompanion only provided HTML work item preview. If there is no TFS connection or if you prefer HTML preview option, the HTML preview containing all major work item fields will be displayed. Following is the same work item, but with that option turned on. Following is the settings in the option dialog that controls the work item preview. 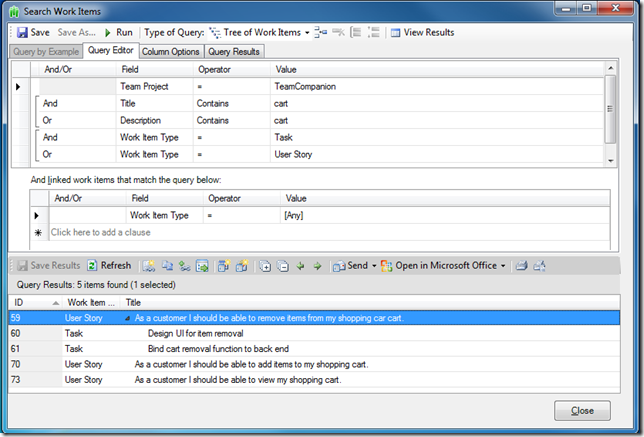 TeamCompanion is the only TFS client that provides the first class support for grouping in the work item query result grid. 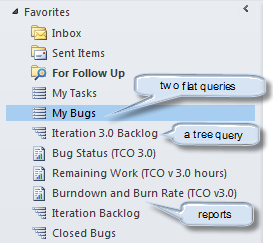 TFS queries are defined by the query text (WIQL), column list and sort order. TeamCompanion adds grouping information to this definition. Grouping defined locally was supported from the TeamCompanion v1.0. Unfortunately grouping information was saved locally and because of that was of limited use. 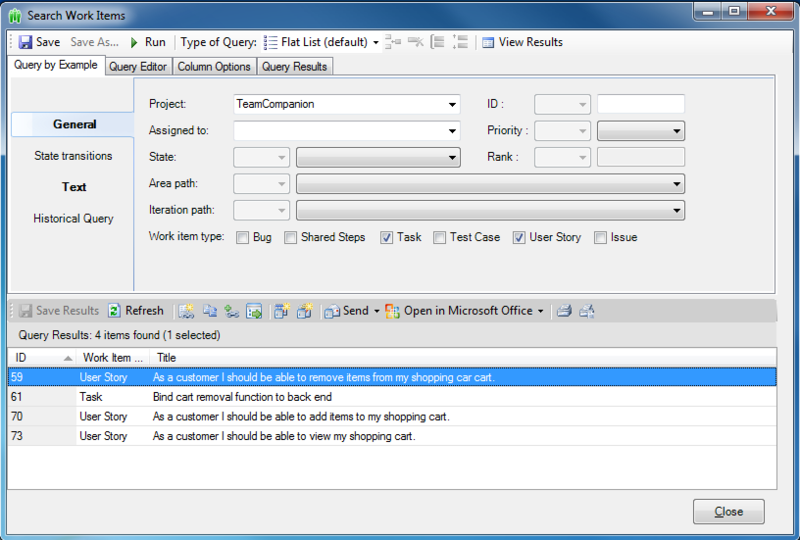 TeamCompanion 4.0 goes further and integrates grouping into the work item query definition. What does it mean for you? 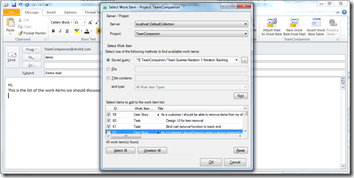 User with sufficient rights can open some query using TeamCompanion query editor, can set grouping along with all other standard query properties (e.g. 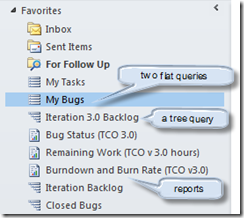 query text, view columns, sorting) and can save that query back to the TFS server. 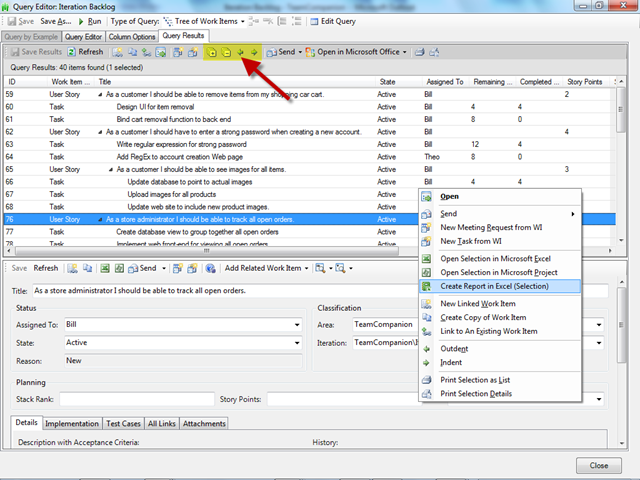 Everybody else in the team, when they open that query in their grouping enabled TFS clients (Outlook with TeamCompanion), grouping will appear automatically because it’s now part of the query definition! Additionally, you can still have local grouping definition. 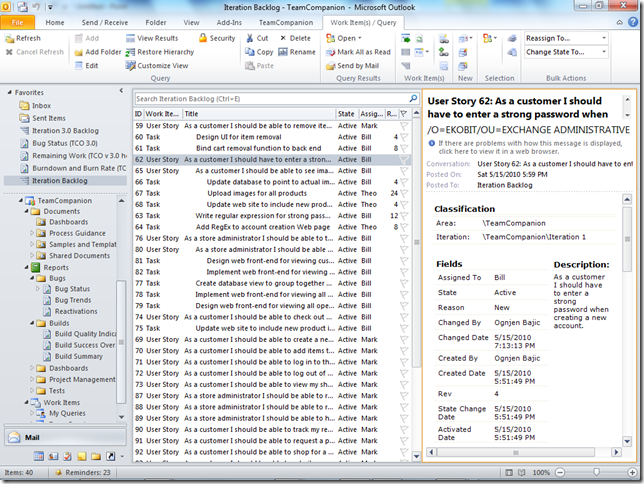 Configure local grouping directly from the Outlook view simply by dragging a column header to the Group By box. Your modifications will even survive query refresh action and will be removed only if the query definition changes on the TFS server. This new button in the work item form, displayed either in red (if work item is not yet closed) or green (if work item is already closed) variant gives you the ability to change work item state to closed (optionally) and to prepare feedback i.e. 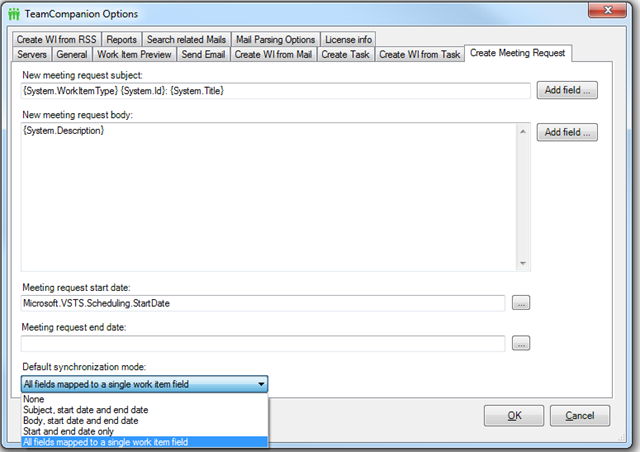 Done mail with information that selected work item was implemented (is Done). This is specially useful for work items that were originally created based on an email, because when such work items are finished and you send the Done email, this email will be proper reply to that original email that was used to create the work item in the first place. Watch video on email integration in TeamCompanion. Done emails are discussed at 1:15. 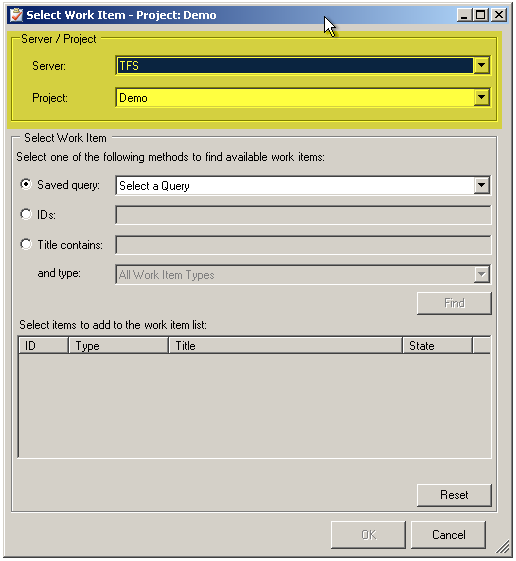 In previous versions of TeamCompanion you had to explicitly refresh the work item query or wait for scheduled refresh to be executed, in order to refresh query result. Now, when you show a query TeamCompanion automatically executes it, so that the current information is displayed. TeamCompanion shows the new or changed work items in bold so that it is clear what has changed since last time you watched that query. This is efficient way to be informed about the changes without using notification emails. Additionally, each query displays information about the last refresh. If the refresh ended with success, you will see date and time of the last successful refresh (grey label). If TeamCompanion fails to refresh work item query, last refreshed label will become red and label tooltip will contain more details about the failure. New TeamCompanion version introduces one more change in a look and feel of the mail, which is generated based on selected work item. Work item title is now a link to the Team Web Access and by clicking on it you’ll be able to directly open selected work item using Team Web Access feature. Changes to work items can be undone before they are saved. This way you can do what if analysis and save the result of your changes only if you are happy with it. Even if you close Outlook and come back, unsaved changes will wait intact. 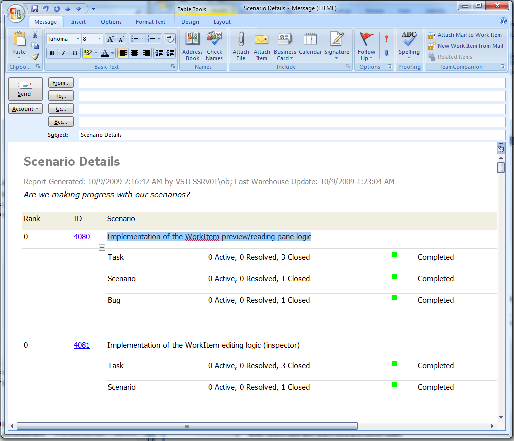 In the work item grid changed work items are displayed in italic and with light grey background. At any point, you’ll be able to undo (or save) all performed changes. If you undo all local changes, all modified work items will be reset to the revision you retrieved with the last query refresh. Quick video overview of Search support. It is very easy to find a work item you’re looking for inside a work item query by entering the search term inside the search textbox located in the upper right corner of the query view. 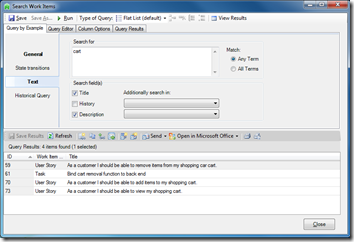 When you enter search term, implicit search will be performed over all work item fields, no matter if they are currently visible or not in the query view. Search results will be displayed in the work item grid and you’ll be able to perform all standard actions with work items from the search result. 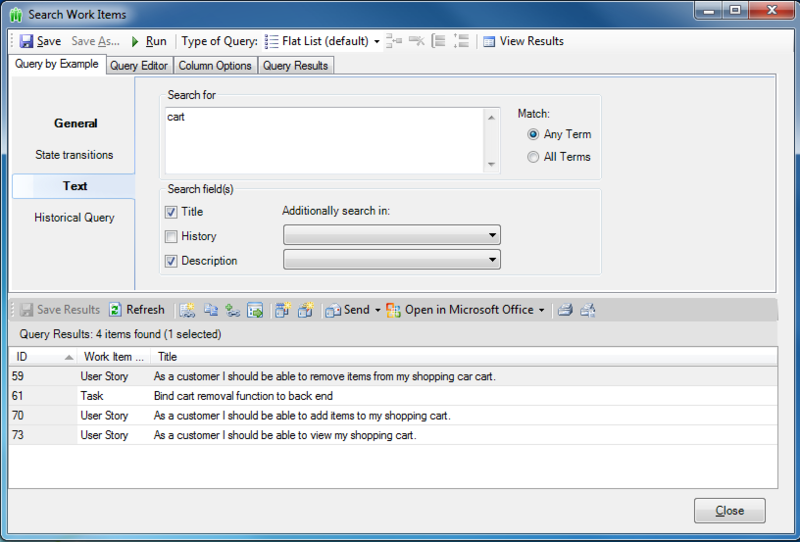 In addition to simple full text search TeamCompanion supports more advanced search criteria by providing IntelliSense like auto completion. As soon as you press [ in the search a dropdown list of all available work item fields will be displayed. Supported operators are <, >, <>, =, ~ (tilde, meaning LIKE), AND, OR. If you have come this far in this extremly long blog entry, you might as well watch one last video – an overview of different work item management features. Most of those features are discussed above. Go and grab your copy at www.teamcompanion.com\Download . Watch all videos at www.teamcompanion.com\Video. For all other information visit www.teamcompanion.com. Have you heard of Professional Scrum Developer course? The goal of the course is to teach attendees on how to successfully use Scrum, modern software engineering practices and Visual Studio 2010 to iteratively and incrementally develop software. Attendees work in self-organizing, self-managing teams using a common instance of Team Foundation Server 2010. This course is suitable for any member of a software development team – architect, programmer, database developer, tester, etc. Entire teams are encouraged to attend and experience the course together, but individuals are welcome too. Attendees self‐organize to form cross‐functional Scrum teams. June 28th – July 2th in Milan, Adam Cogan from SSW will be presenting the first Professional Scrum Developer course in Italy. July 26th – 30th July in London, Adam Cogan joined by Martin Hinshelwood. There is a special offer for these two courses reducing the cost from $3995 to $1995. And if you are more inclined to take the course in German, there is the course held by Neno Loje on July 26th –30th in Munich. TeamCompanion for Outlook v3.0 has just been released. A month ago Microsoft released Visual Studio 2010, Team Foundation Server 2010 and few weeks later Outlook 2010. TeamCompanion 3.0 brings support for all three of them and more. Although a major one, this release is a free update for all existing customers. TeamCompanion 3.0 has full support for Outlook ribbons. All objects have their appropriate icons. This is especially convenient when you put some of the objects (SharePoint document library folder, report or work item query) in the favorite folder as visible on the right picture below. Support for work item query folders together with the ability to control the permissions makes it possible organize the work item queries in folders and make some folders visible only to those team members that will really need them. This way although there may be hundreds of queries and dozens of folders the work item query list will remain clean and usable. 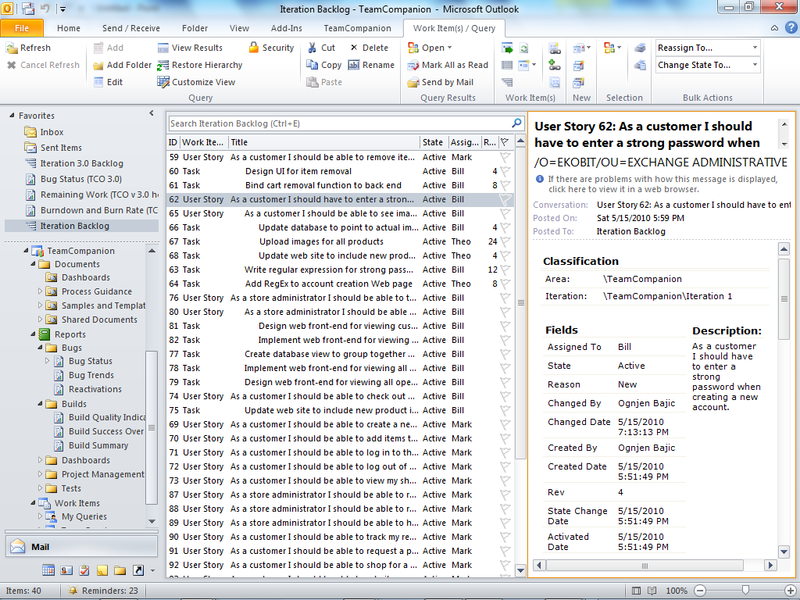 TeamCompanion 3.0 supports showing hierarchical queries in an Outlook embedded view. This is a read only view but with just one click you can open the same query or just the selected work items in an editable view. 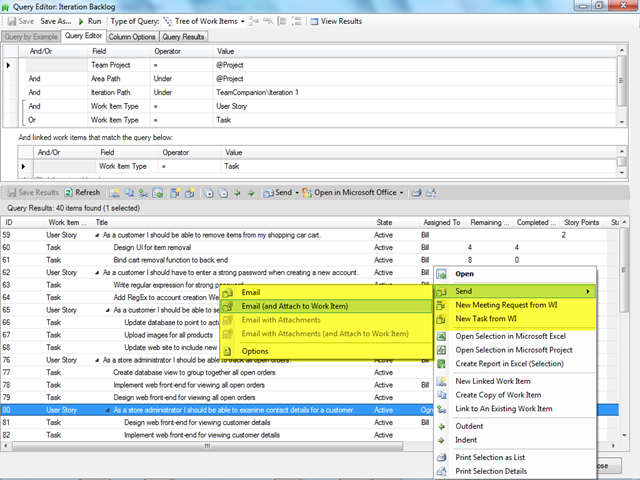 View Results context menu command (available from the ribbon too) opens the whole query, whereby Edit Work Item command opens the editable work item view containing just the work item that were selected in Outlook. 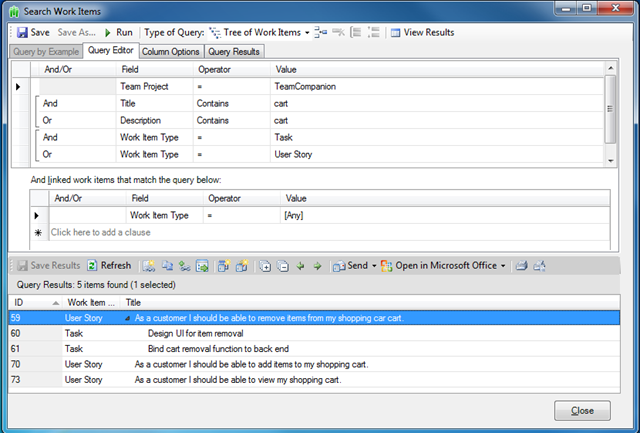 Using View Results command editable Query Result view can be opened. In this view a rich UI for working with and editing hierarchies is supported (marked with arrow and yellow in the image below) – Expand All/Compress All, Indent/Outdent and drag and drop let you change the hierarchies with ease. Here we support virtually all commands available in Team Explorer and add additional commands related to Outlook integration. 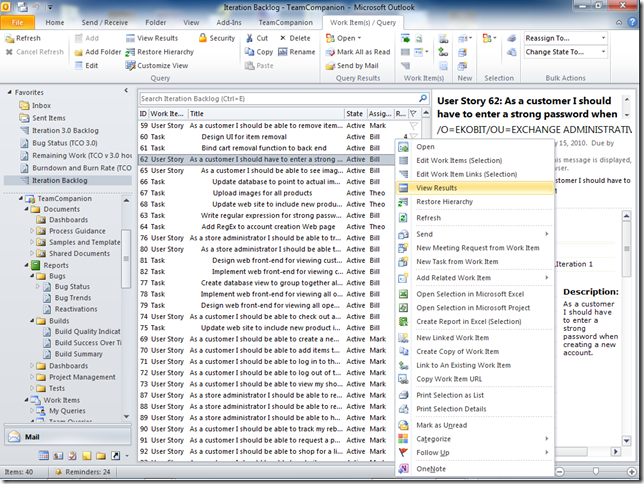 Alternatively user can switch to the query editor. The same commands are available here too. In the image below the commands related to Outlook integration are marked yellow: sending a work item as an email in several ways, creating appointment for a work item or creating Outlook task for a work item. If you want more just switch to tree or direct links query and edit the query further. 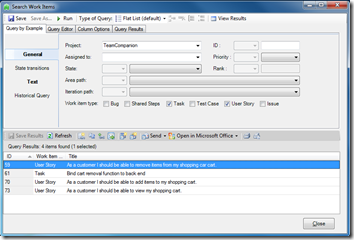 Query by example will turn off until you switch to the flat query type again. With TeamCompanion 3.0 you can manage SharePoint document libraries directly from Outlook. When the project’s root node is selected TeamCompanion shows project homepage. 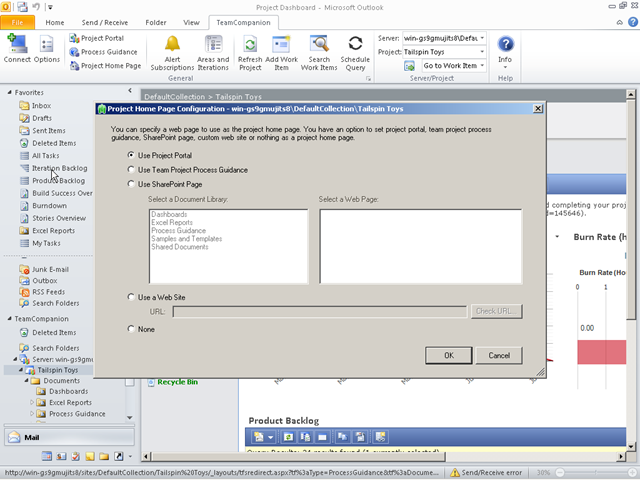 By default this is the project portal homepage, but user can configure it to basically anything. TeamCompanion v 3.0 introduces a number of smaller features. Most notable among them are Open Test Case for Edit in Microsoft Test Manager button in the work item form for the Test case work items, Insert Work Item Table command while editing emails and Update work item from appointment. Open Test Case for Edit is the way Team Explorer too enables editing of the Test steps, since the test steps control in the work item form is read only. 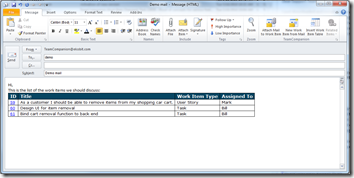 Insert Work Item Table is an easy way to insert work item information while editing an email. 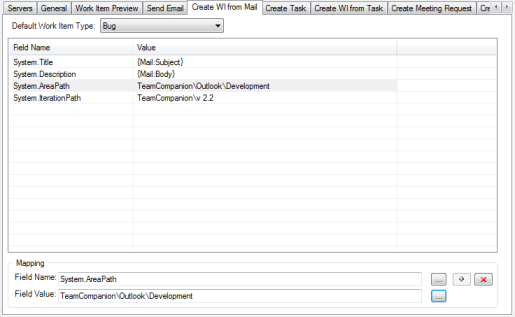 One of standard features of TeamCompanion is ability to create an Outlook appointment for a work item. Update work item from appointment action makes is it easy to propagate changes made to such appointment back to the work item it was created for. Below you can see different options defining which appointment fields are propagated back to the work item. That’s it. Visit www.teamcompanion.com for more on TeamCompanion. If you have been using earlier versions of TeamCompanion, enjoy the free upgrade. Download the new version (trial) and install it over your current installation. Your current license will remain active. If you are new to TeamCompanion, download the 90 days free trial and try it out. One of the new features introduced in the TeamCompanion 2.2 is the ability to customize the new work item preview. b) programmatic – you override the xsl file used for formatting the xml generated by the TeamCompanion. You can do anything you like there. c) mixed - above options combined. Included lists are used to specify all the fields you want included in the Work Item Preview. Excluded lists specify all the fields you want excluded from the Work Item Preview. 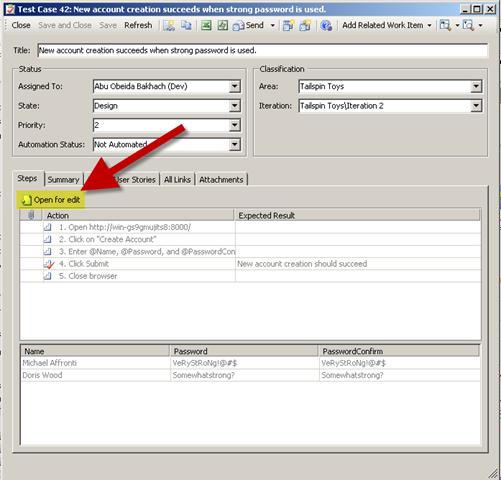 Included or excluded lists are semicolon separated lists of work item fields Reference Names. For example: „System.State;System.CreatedDate;System.CreatedBy;System.IterationPath;“. 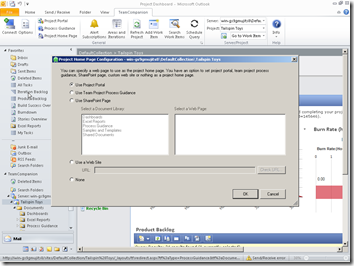 It is an error to use both Included and Excluded lists at the same level/priority in registry. In that case TeamCompanion will use Excluded list. The order of work item fields in the list is important. 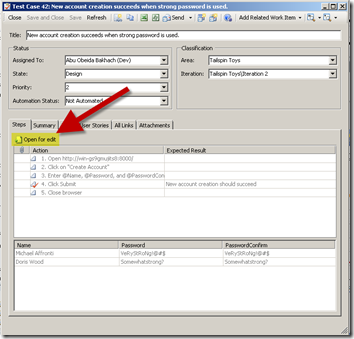 There are different locations where the Included/Excluded lists may be saved in the registry. c) one particular work item type in one particular project and server. <server_name>, <project_name> and <work_item_type_name> represent Registry keys named after the server, project or work item type containing settings for a specific server_name, project_name or work_item_type_name respectively. <server_name> is the name of the TFS server as it is displayed in the TeamCompanion’s UI (tree control): TFS_FQDN.PortNumber. e.g. tfs.test.com.8080 (notice that there is a DOT between the server name and the port number). In the scheme shown above, "[IncludedPreviewFields] or [ExcludedPreviewFields]" are all valid places where „IncludedPreviewFields“ and „ExcludedPreviewFields“ lists can be put. Each of these three places defines different validity scope. If for particular work item type, project and server there are settings defined on different levels, the setting on the lowest level will apply (work item level takes precedence over project level which takes precedence over server level). For some Work Item first will be used list specified in its key. If it isn't present, then the list in project key will be used. If that one also isn't present, the one in server key will be used. If there is no list that apply to that Work Item type, project and server, the default settings will be used. We might provide proper UI for these settings in some future version. For example, „D:\MyFolder\CustomXSL.xsl“. In case of any error while using that file, TeamCompanion will fall back to the default embedded XSL. Attached you can find a sample xml (normally dynamically generated on the fly by the TeamCompanion) and sample xsl that is used to transform the xml in order to produce the work item preview. This setting can be edited from the TeamCompanion UI using the checkbox check box named „Remove empty fields from Work Item preview„ available in the Work Item Preview tab of the TeamCompanion options dialog. If it is checked, empty fields will be removed (exception from this is if the field with the empty value is explicitly listed in the appropriate IncludedPreviewFields list, in which case they will not be removed). [Update] Users having work item query folders where some work items already exist, need to remove and reload these work items for the new preview settings to become effective. This can be done by selecting all work items and deleting them by pressing Delete key on the keyboard. Don’t worry – your work items will remain intact. This will only delete cashed offline information about them. Execute the query once again (by executing Refresh command from the folder’s context menu) or, if you have scheduled execution of this query, wait for the schedule, and all work items will appear once again, this time with the preview formatted in accordance with your new settings. Earlier this week Ekobit released the TeamCompanion for Outlook v2.2. This is a minor .x version and as such it comes with some new features and many improvements of existing ones that complement and enhance existing functionality. In this version we address many usability obstacles in order to ensure smooth and efficient usage patterns throughout the application. This release is a free update for all existing customers. Separate TeamCompanion’s offline mode doesn’t exit any more – we’ve merged it with Outlook’s offline mode switch (File\Work Offline menu option). Previously TeamCompanion’s offline mode was available in the Options dialog which wasn’t discoverable. We have heard the feedback and reorganized both internal logic and UI. We deal with occasionally connected situations much better than before – using logic running in the background TeamCompanion detects if the Outlook is online or not and adapts itself. 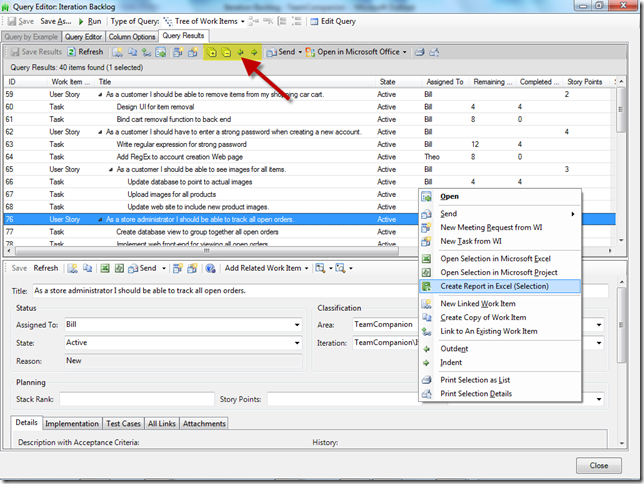 Actions that automatically connect to the server (like scheduled work item query execution) are executed only if Outlook is really online. Refresh/Undo actions are supported now. There are different new ways to send work item as mail. Four alternatives are supported: send work item as mail with or without attachments and with or without subsequent attaching of the mail back to the work item after the mail is sent. 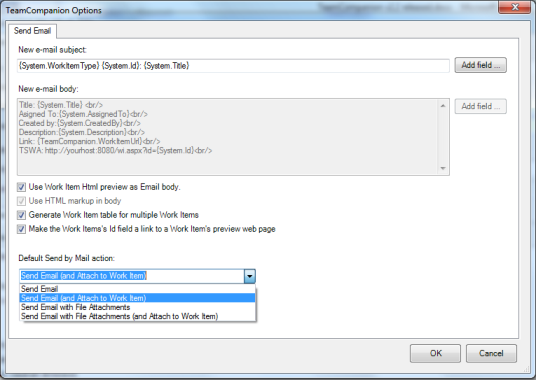 The default 'Send Work Item as Email' action type can be set in the appropriate options dialog. Two new buttons in the upper right corner of the work item form make it very easy to find emails related to the work item – they search for mails containing either work item Id or Title. By default all mail folders are searched, but the search can be done in just some specific mail folders (configurable in Options dialog). The result of the search is the usual mail list UI in which we can execute all standard mail related actions. • programmatic – you override the xsl file used for formatting the xml generated by the TeamCompanion. You can do anything you like there. • mixed - above options combined. Details of preview customization are beyond the scope of this overview and will be covered in some future blog entry. Second new feature of the HTML preview is the support for the work item history. This can be switched on and off in appropriate Options dialog tab. Additionally, for performance reasons, user can set the number of history entries that will be available in the preview. Upgrade users having work item query folders where some work items already exist, need to remove and reload these work items for the History to become visible in the work item preview. This can be done by selecting all work items and deleting them by pressing Delete key on the keyboard. Don’t worry – your work items will remain intact. This will only delete cashed offline information about them. Execute the query once again (by executing Refresh command from the folder’s context menu) or, if you have scheduled execution of this query, wait for the schedule, and all work items will appear once again, this time with history in the preview. In addition to mapping email fields and work item fields used when creating a work item based on an email, it is now possible to fill email fields with constant values. Internally, we call this feature “poor man’s work item templates”. It is especially usable to set the current iteration and (at least a part of) area information. With this little feature, in many occasions, just one click is enough to create fully populated and valid work item from mail. Open related object action was introduced in TeamCompanion 2.1. 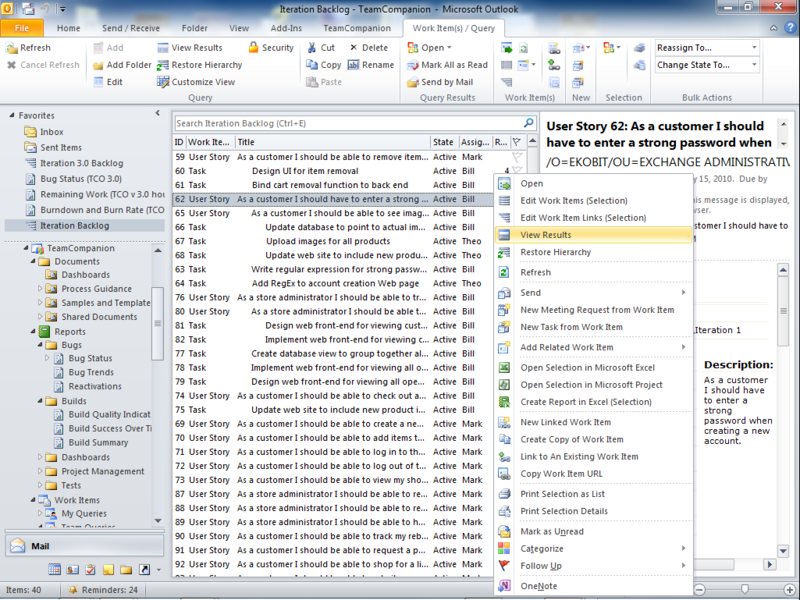 This feature makes it easy to open TFS objects mentioned in an email (work item, changeset or build). In 2.1 we were able to offer just one most significant object and in v2.2 as long as there are multiple objects referred to in a mail, we will offer all of them. There are different methods we use to find object references (like parsing object urls, different patterns in the mail content etc.). If you believe we should be able to find a reference to an object in some mail of yours and we don’t, please contact me directly and hopefully we will support it in some future version. 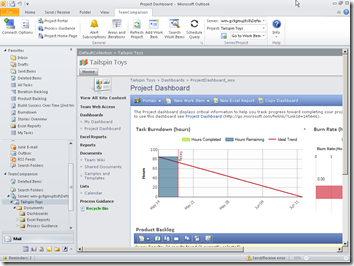 Two new conversion formats for reports are supported- embedded HTML and Web Archive. Embedded HTML is the new default. This way the text in the report description isn’t just a part of the image anymore and can be selected, copied etc. Cancelling report execution is also supported. There are four ways to send a work Item as Mail – with or without attaching Work Item attachments to the mail and with or without subsequent attaching the mail to the Work Item after the mail was sent. Wherever there are Work Items in the TeamCompanion’s UI they can be sent as mail. The content of the mail is completely configurable (but that is not new in v2.2). TeamCompanion v2.2 works with prerelease versions of TFS 2010 using the Team Explorer 2008 SP1 upward compatibility support. The restrictions imposed by the scope of compatibility support are described here. Where the is an optional, server level argument. Example connection Strings looks like: http://myserver:8080/tfs/Collection or http://server:8080/tfs. 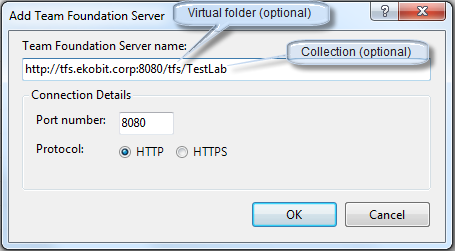 If the server virtual folder is defined during the server installation it must be included in the server url. If you don't explicitly put project Collection name in the server url, you will be connected to the Default Collection. Expect this compatibility issues to be solved in future TeamCompanion versions. Microsoft CRM Outlook Addin seems to be relatively fragile and in some cases it refused to load if TeamCompanion was present. TeamCompanion v2.2 behaves the way CRM Addin expects, waits for it until it is initialized and only then it loads itself. This way these two Outlook Addins can coexist peacefully. TeamCompanion is tested for compatibility and reliability on Windows 7. For this version, the UI has had considerable amount of improvements. We engaged SSW to do a Software Audit for UI usability and Adam Cogan was great as we went back over 4 iterations. We hope you notice the difference. If you are interested in learning more see SSW's User Interface rules or have an auditor performed on your own software. There are many others that have helped shaping TeamCompanion v2.2, but I would personally like to thank Gregg Boer from the Team Foundation Server’s development team, who was willing to use various prerelease versions in his daily work and to test them thoroughly. Gregg suggested many features that in the end appeared in the above list. Hopefully this rather long blog entry gives you a quick flavour of TeamCompanion 2.2 and where we are going with this release. As soon as you try it out, we would love to hear what you think of it.